There’s a lot of work to be done to get a house in order for a pending home sale. Not only does the curb appeal need to be picture perfect to entice the most discerning shoppers, but the immediate entryway of the home is the next most influential impression that will be made on potential buyers. Entryways, or foyers, are unique to each style of house. Some variations will be compact with little space to improve (think a split-level landing) or they may be expansive enough to serve as a welcoming area with a bench and storage to double as a mudroom. These small projects will help you assess which updates your entryway needs to set the stage for a must-have home! First and foremost, buyers want clean and move-in ready homes. Pull out all the tricks and gadgets to get corners and baseboards clean. High ceilings harbor dust and webs, as do light fixtures and decorative ledges. High traffic flooring shows wear and tear quickly. Mopping might do the trick, but carpet removal and a new floor install or refinish are also distinct possibilities. Hopefully, a quality area rug is all you need to define the space and add visual interest. The next most popular adjectives buyers reference after clean are typically bright and airy. Give the buyers what they want and add lighting in any way possible. A floor lamp is an easy fix for a dark corner, as is a table top lamp. If windows are in the entryway, strongly consider removing the covering to let natural light stream through the space, after they have been impeccably cleaned, of course. Replace any dimming or dying light bulbs to maximize shine. If the entryway has dark paint or needs updating to brighten up the space even more, choose a durable and scrubbable paint formula. The entry takes a beating with tossed keys, boots, and dog leashes. Neutral paint will serve sellers the best. Any local home improvement center can recommend the popular colors in your neighborhood. Buyers are wowed by architectural upgrades. 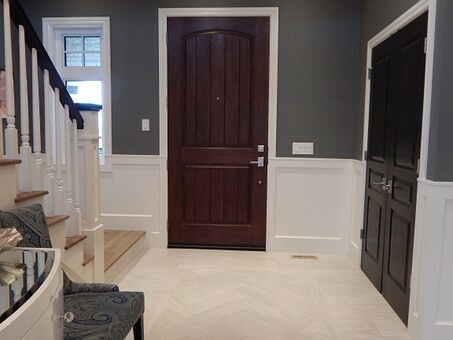 The entryway is typically a small space, so the addition of architectural detail is very affordable. Crown and chair moldings, bead board, and ship lap will make most of them smile. Consider the front door as part of the architecture as well. It’s probably time for a paint refresh and minor repairs. Or, a major overhaul with an entirely new door system installed might be warranted. Don’t worry, a front door is one of the best investments you can make to turn a profitable home sale. Many homes showcase a beautiful stairway soon after entering. What kind of condition are the stairs and balusters in? Any broken or unsafe pieces need repair or replacement. Repainting or additional staining will bring new life back to heavily used stairs. Some entries provide storage solutions for seasonal clothing, pet supplies, and other daily necessities. If your entryway houses shoes, umbrellas, and backpacks, upgrade current containment solutions with matching baskets or buckets and hanging systems. Uniformity brings calm to an area that tends to be in disarray. Home shoppers also want to see exactly how much space is available for storage, as it always remains on their most desired features list. Too many accessories in the foyer are considered clutter in the eyes of the buyer. Pare down to the best quality options you already have on hand. A console table or seating arrangements are great options, but only if the fabric and paint are up to date. New lamps pull double duty as functional pieces as well as decorative accessories. If the base is timeless, perhaps updating the shade is all that is really needed. Artwork and other decorative table top items bring a bit of life into a very practical part of the house. Don’t hang family portraits or display a line of personal pictures in frames, but use classic photography of destinations you prefer. They make an eye-catching statement, and possibly a personal connection with a potential buyer. Framed mirrors are useful for one last check on the way out the door to greet the day, but they also reflect light, producing the appearance of a larger space. The entryway should entice buyer’s senses. Not just visually, but also in textures from rugs or pillows and incorporating clean, fresh (not overpowering) scents from flowers or tucked away air fresheners. All of these components will provide a welcoming atmosphere that buyers appreciate and will likely lead them to spend more time considering the purchase. To earn the most from your pending home sale, perfect your house using MilitaryByOwner’s library of guidance for each step of the home selling process. From researching the best-selling price point to staging for an open house, we've covered it all!